As previously mentioned, I’m way overdue for a review of Nestle FruTips from China. When I was in Shanghai this March, I bought of couple of fresh tubes to cover today and Friday. I’ll start with the Mango, Grapefruit, and Lychee tube. 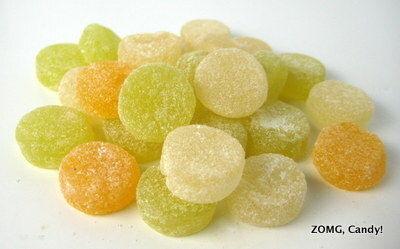 The FruTips were thumbnail-sized flat disks that were covered in gritty sugar sand. The chew started off mostly soft with a bit of tension, then became softer and stickier as I chewed. The texture was smooth and felt like limpid jelly on my tongue. Grapefruit was a white with a greenish tinge. It was tart with a slight pithiness that highlighted its bright citrusy grapefruit flavors. Mango was a pale orange. It was round and floral with nice flash of tartness at the end, and it tasted of the tropical seediness of ripe mangos. Finally, Lychee was white and tasted just like real lychees, though more like canned lychees than fresh ones. These were sweetly floral and addictively tasty. I wish these were available in the U.S. They’re a great combination of flavors that we usually don’t get in American candies, and I enjoyed their intense fruit flavors and chewy texture. An OMG. According to Wikipedia, these guys may be available in Canada. 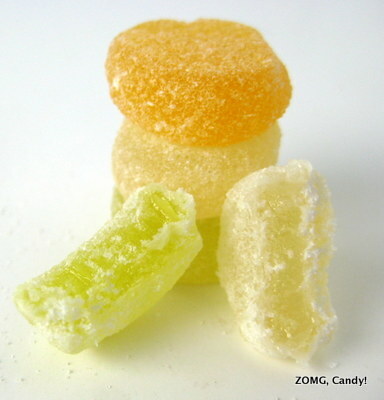 They may be the same thing as Rowntree’s Fruit Pastilles, which I had reviewed before in a different flavor arrangement but didn’t care for at the time.